Shea butter is one of the most popular cosmetic ingredients nowadays. According to Shea Butter Market Global Research Report, the total collectible production of Shea butter in 2015 was 600,000 tons! What is even more interesting, while application of shea butter as food accounts for the largest share by usage, cosmetic is expected to drive the fastest growth in the next five years. And I have to admit that the positive reputation and popularity of shea butter is very well deserved, as it has numerous benefits for hair and skin. That is why the answer of the question is shea butter comedogenic is an important one for all (future) shea butter users. If you want the answer straight away, jump to the last section of this text. First off, it’s rich in five great components: oleic acid, stearic acid, palmitic acid, and linoleic acid. Linoleic acid is a substance our body needs to function correctly, but cannot organically produce. We have to find it from external resources, such as shea butter. Vitamin A and vitamin E keep our skin healthy. They are especially useful for curing damaged from the sun skin. They have an anti-wrinkle effect, soften and whiten the skin, as well. 12. Shea butter has a beautiful effect on your baby’s skin, gently massaging it and relieving baby’s rash. You can go one step further and find cosmetic and sanitary products, which include shea butter as an ingredient in their formulas. A stable version of this approach is to find natural cosmetics, which professionally blend different components. It is a matter of market search to find those products, that will work well for your skin and hair. While finding high-quality products might appear is not a very easy task is not hard if you follow some basic rules for natural hair care and natural skin care. But let’s get back to our initial topic. Where is shea butter in the comedogenic list? “a small bump or blemish on the skin (as of the face or back) usually containing a plug of sebum in a skin pore: such as open comedo (blackhead) or closed comedo (whitehead)”. Following this definition, we can conclude that the more comedogenic a substance is, the more it will clog pores – these tiny holes on our skin. In a negative scenario, our skin will produce more sebum than needed, which combined with the dead cells on the skin surface, can clog the pores. 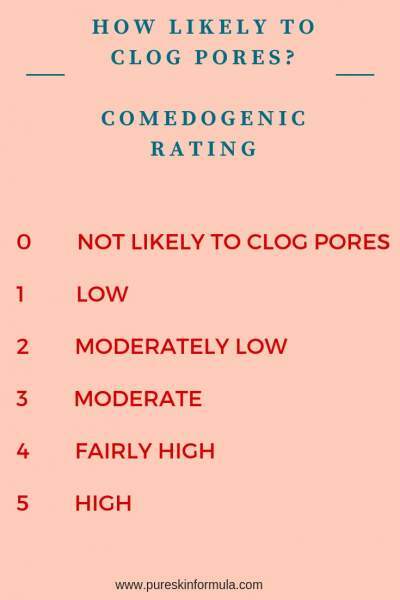 Here comes in place the comedogenicity index, which shows us how comedogenic is a component. 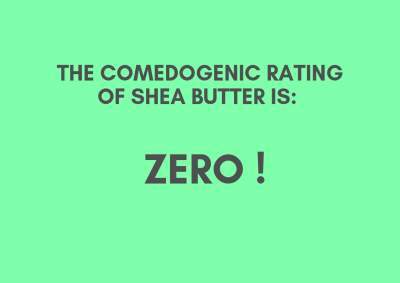 And here comes the good news for shea butter, as it is classified with 0 rating, which literally means “not likely to clog pores.” It very easily penetrates the skin, allowing it to breathe. 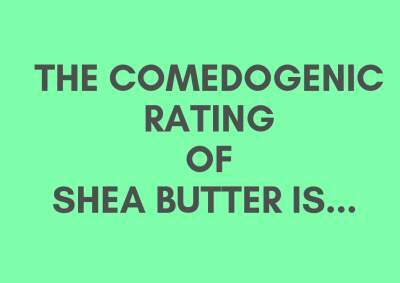 Is shea butter comedogenic? No, it is not, and you can freely use it for your needs, irrespective which way you will choose. Your next step? Search and test products with shea butter, which work well for your skin. Now you are familiar with one more instrument to treat yourself in the best possible way! I would love to hear from you! Do you (plan to) use shea butter? Leave me a message, and I will answer you!